A filthy message dated 1902 and scrawled on a wooden pillar beside the front door has been uncovered during a £12 million ($18 million) restoration of Kensington Palace. Staff at the Kensington Palace found the graffiti from 1902 in perfect condition several months ago. 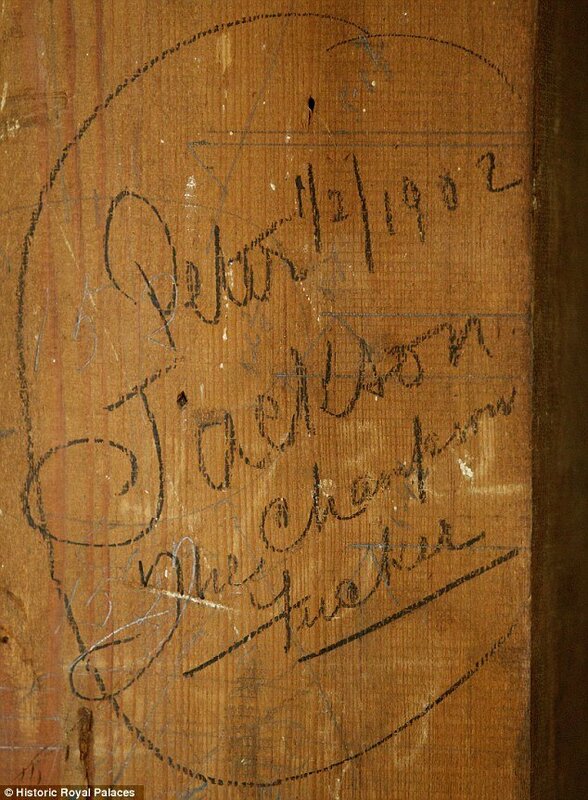 Written neatly in pencil on a timber post supporting the ceiling beside the palace’s front door and boxed in by wooden panelling were the words: “Peter Jackson, The Champion f****r” dated 1/2/1902. The timber which was rotten after 109 years has now been replaced with a steel joist – but the inscription has been preserved and kept in storage. Lee Prosser, Buildings Curator at the Historic Royal Palaces charity said a bottle of whisky was also found tucked in the panelling with a newspaper cutting pasted to the post that showed a group of old men sitting together. Lee Prosser: “We found it a couple of months ago. It was covered with boarding and when we took it off, there it was. “Unfortunately we know nothing about who he (Peter Jackson) was. My feeling is that he was a carpenter. “There are many instances of graffiti at the palaces, including some similarly rude and rather graphic Tudor etchings at Hampton Court Palace, as well as numerous more poignant messages carved into the stone walls by prisoners at the Tower of London. “You often get that with workmen – people like to write their names – we have often found other bits in the palace where people have written their name It’s not that unusual”. Lee Prosser had at first assumed that the scrawl had been the handiwork of Peter Jackson himself but a further scrawl, which showed an arrow pointing to one of the men in the photograph in the newspaper with Peter Jackson’s name on it has led him to believe that it was penned by one of his workmates. The curator said: “I was really surprised that people used words like that 100 years ago and then even went to write it down. We found it quite amusing. This is not the first time royalty has had to contend with a spot of bad language. The late fashion designer Alexander McQueen was working as an apprentice in the Savile Row workshop of Gieves & Hawkes in London when bored one afternoon, he wrote “I am a c***” in the lining of a suit jacket destined for the Prince of Wales. Other interesting finds during the palace refurbishment have included some pretty tin items which appear to come from Nottingham House – the first building on the site – and a swathe of late 18th century green verditer wallpaper with a decorated border, hidden behind an architrave. Originally built in 1605 as a private country house, Kensington Palacewas purchased in 1689 by King William III and Queen Mary II, eager to escape Whitehall. 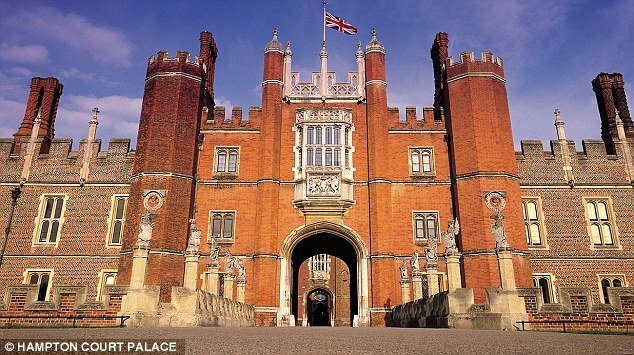 The two-year restoration project that has been carried out by Historic Royal Palaces is now in its closing stages and will see the palace re-open in March to coincide with the Queen’s Diamond Jubilee. Kensington Palace has been home to some of the country’s most famous royals, including George II, Queen Victoria, Princess Margaret and Diana, Princess of Wales. Many intimate items will be on display for the first time including jewellery, paintings, books and a uniform that belonged to Queen Victoria’s husband, Albert. Clothes to be shown include a pair of mourning stockings that are black on the legs and white at the feet, which Victoria wore after Albert died in 1861. Visitors will walk across a new carpet in to which quotes from passionate love letters Albert wrote during the couple’s engagement have been woven. A sound and light installation will re-create the atmosphere as it was in the Red Saloon on June 20 1837 when Victoria realised she was now Queen following the death of her uncle William IV. Kensington Palace includes contributions from some of the most renowned architects of the past three centuries, including Sir Christopher Wren, Nicholas Hawksmoor, Sir John Vanbrugh, John Nash, Colin Campbell and William Kent. During building work, the restoration team uncovered many traces of their predecessors attempts to maintain what started out as a Jacobean house. The most alarming – perhaps aside from the graffiti discovered – was when the foundations for the new cafe, shop and sunken garden were dug up and a long buried spring bubbled up to the surface and turned the ground into quick sand. Canada: Taylor Van Diest beaten to death on Halloween night as she was dressed as zombie.